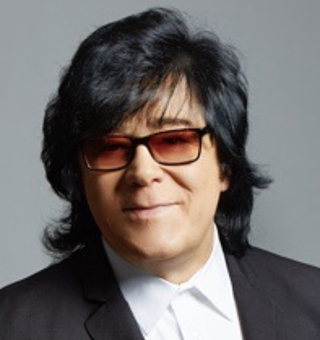 John Titta, who is based in ASCAP’s New York City office, is Executive Vice President, Membership (Head of Membership) for this top performing rights organization (PRO). Titta works closely with ASCAP’s writers & composers in all genres of music, including pop, rock, country, hip-hop, R&B, Latin, symphonic & classical, film & TV music, and musical theatre. He oversees a national team of ASCAP membership representatives, who are based in Los Angeles, New York, Nashville, Atlanta, Miami, San Antonio and Puerto Rico. Since joining ASCAP in 2013, Titta has been instrumental in its membership efforts, including the acquisition and retention of many prominent members, development of innovative business practices, and the programming of the highly successful, annual ASCAP “I Create Music” EXPO. He is also involved with ASCAP’s many workshops, songwriting camps, award shows and other events and programs. Titta began his music career as a professional musician and music teacher, and he then became a successful and respected music publishing exec. His first publishing position was at Screen Gems/EMI Music, where he worked with such legendary songwriters as Carole King and Lou Reed. From there, Titta moved to PolyGram Music Publishing as Vice President of A&R in 1988, signing such artists as Bon Jovi, Richie Sambora, Pearl Jam, Brian McKnight, k.d. lang, Billy Ray Cyrus and songwriter Jimmy Webb. From 1993–2006, Titta served as Senior Vice President/General Manager of Warner Chappell Music in New York. As head of Warner/Chappell’s East Coast operations, he signed such acts as Trey Songz, Fat Joe, Missy Elliott, Kid Rock, Collective Soul, India.Arie, Gavin DeGraw, Cassandra Wilson, Dan Wilson, Uncle Kracker, Shaggy, Duane Eddy, Bruce Hornsby and James Brown. He also scored success with individual hits such as the Grammy Award-winning “Smooth” by Santana, “Cry Me a River” by Justin Timberlake, “Lean Back” by Terror Squad, “Waiting for Tonight” by Jennifer Lopez, “One of Us” by Joan Osborne, “I Love You Always Forever” by Donna Lewis and “Pon de Replay” by Rihanna. Then after leaving Warner-Chappell, Titta served as CEO of MPCA Music Publishing, a company he founded in 2006. Titta other accomplishments include working with Bon Jovi keyboardist David Bryan on the Tony Award-winning musical Memphis, plus songs recorded by John Mayer, Bob Dylan, Cyndi Lauper, M Ward, and A&R work on albums by Dionne Warwick, Todd Rundgren, Melinda Doolittle and Donny & Marie Osmond. Notably, he serves on the Board of Directors for the Songwriters Hall of Fame. ASCAP (The American Society of Composers, Authors and Publishers) has long been known as the worldwide leader in performance royalties, service and advocacy for songwriters and composers, and the only PRO owned and governed by its writer and publisher members. ASCAP has over 670,000 members representing more than 11.5 million copyrighted works. 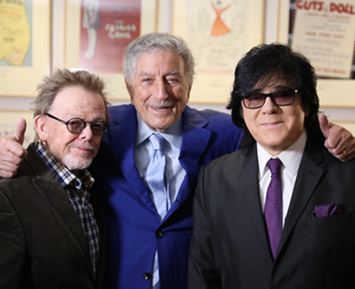 Pictured (l-r): Paul Williams, Tony Bennett and John Titta. 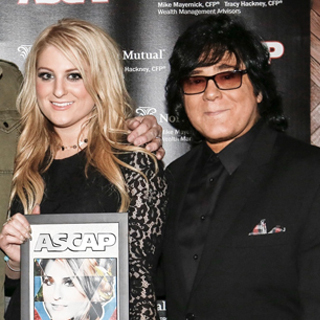 ASCAP represents many of the world’s top songwriters in all genres of music. Here’s a small sampling of songwriters who are affiliated with ASCAP: Stevie Wonder, Max Martin, Kendrick Lamar, Justin Bieber, Ariana Grande, Cardi B, Justin Timberlake, Meghan Trainor, Lin-Manuel Miranda, Benj Pasek & Justin Paul, Drew Taggart (Chainsmokers), Migos, Gucci Mane, Quavo, Katy Perry, Greg Kurstin, Stargate, Desmond Child, Dan Wilson, Calvin Harris, Sam Hunt, Chris Stapleton, Ashley Gorley, Kelsea Ballerini, Josh Osborne, Maluma, Marc Anthony, Romeo Santos and Carter Burwell. We are pleased to do this new Q&A interview with John Titta. He recalls his years as a music publishing exec prior to working at ASCAP, and he discusses his ASCAP position as Head of Membership, which includes helping songwriters & publishers, and coordinating many workshops, events and programs. DK: How did you get started as a musician? John Titta: I fell in love with music at an early age, and I learned to play guitar, piano and other instruments. At my house, there are instruments everywhere—mandolins, ukuleles, drums. DK: What was your first job doing music? Titta: My first job in the music business was as a music teacher in the public school system in New York, and as a private instructor. I was a certified teacher, and as I was working toward getting my Master’s degree, I’d been taking lessons with a prominent jazz guitarist named Chuck Wayne, who played with Woody Herman and Tony Bennett. We were friendly, and he said, “If you want to make some extra money, I get called for a lot of dates and sessions. I can’t take everything…you can handle it if you want it.” I said “Sure,” so I started doing recording sessions for commercials and things like that. And I started getting these incredible checks, which was far more than my school teacher job paid. It was then that I made a conscious decision to become a (pro) musician. So I started doing that, and I started meeting more people who were creators. I was playing these sessions, and I started writing songs with people. I found myself writing with songwriters who were signed to Screen Gems/EMI Music. Pretty soon, I was hanging out at Screen Gems all the time, and a job became open there. It was in the tape room, which at the time was just one rung up from the mailroom. And I was thinking…Yeah I’ll do this—I’m writing with these people and I’ll learn about publishing. So I worked in this tape room and I learned about their song catalog. I would make suggestions and pitch songs from the tape room. I started getting songs placed—mostly with songs from the back catalog. One of my first cuts was placing “The Look Of Love” (by Burt Bacharach & Hal David) with Grover Washington Jr. Then I got “Natural Woman” by Carole King in a commercial and the people at Screens Gems asked me if I ever thought about being a publisher. Pictured at the ASCAP Centennial Awards (l-r): Billy Joel, Stevie Wonder, Joan Baez, Garth Brooks and John Titta. One day, Carole King reached out and asked if I would like to have lunch. That was a pivotal day for me. Here I am having lunch and working with one of my idols. It really made me want to pursue music publishing. Soon after, I was promoted to the position of Professional Manager (pitching songs and working with songwriters), and I really enjoyed that. DK: How many years did you work at Screen Gems? Titta: I was at Screen Gems for four years, and then I had an opportunity to work at Polygram Music (as Vice President of A&R). I had some pretty good years there; I signed a group called Mother Love Bone which became Pearl Jam. I also worked on the Two Rooms tribute album that celebrated the songs of Elton John & Bernie Taupin. I was also involved in some good cover hits like “Save The Best For Last” with Vanessa Williams, and we helped develop (R&B artist) Brian McKnight. DK: When did you start working at Warner/Chappell Music? Titta: I started in 1993 and I became Head of Warner/Chappell’s New York office. I was there until 2006. I was mainly doing acquisitions, while still pitching songs. I signed Kid Rock, and I did a development deal with Gavin DeGraw and we got him his record deal. I was involved with the hit “Smooth” for Carlos Santana. One of the great things about Warner/Chappell was I had the honor to work with the legendary music publisher Frank Military. I learned so much from Frank. DK: After your 13-year run with Warner/Chappell, I read that you started your company MPCA Music Publishing, in 2006. Titta: Yes. I was friends with a prominent, independent publisher named Billy Meshel, who encouraged me to do something independently. I bought Billy’s catalogue, which contained the complete works of the legendary king of the blues, Robert Johnson. And then I started to build from there by buying other hit songs and catalogues, including a catalog of songs by the legendary Sammy Cahn. I did that for six or seven years. DK: How did you decide to join ASCAP? DK: When you joined ASCAP as Head of Membership, what were some of the goals you had? Titta: I wanted to take some of the creative skills I learned as a publisher to help songwriters at ASCAP. ASCAP has great events like the annual ASCAP “I Create Music” EXPO and many workshops and showcases, and I wanted to contribute to their development. It’s all about helping this group of people—songwriters—who I think help the world so much with their music. Music and songs have such a positive impact on so many people’s lives. So anytime I can help songwriters, that’s what I want to do—to recruit new talent and help established talent with anything they need. DK: ASCAP EXPO has been an excellent conference for songwriters each year in Los Angeles. Titta: It’s been great helping to host the EXPO each year. We have a whole team at ASCAP that produces the EXPO. Everybody gets inspired at EXPO, from the people on the stage who are doing the keynotes and panels, or the great performances, to all the attendees. We’ve had many special moments at EXPO. Last year, Stevie Wonder was a fantastic speaker and he performed many of his songs. We’ve also had great appearances by Michael McDonald, Melissa Etheridge and many others. DK: Besides EXPO, what are some of the other events and workshops you host? Titta: We have a lot of song camps, where people get together to co-write and network. We do various song camps; we did a Latin one with Marc Anthony’s publishing company last year. We have a camp at The Castle in France (at Miles Copeland’s place) which is a great one. A couple years ago at The Castle, Priscilla Renea, Brett James & Chris DeStefano wrote “Somethin’ Bad,” which became a #1 hit duet hit for Miranda Lambert & Carrie Underwood. And last year, we hosted a Rhythm & Soul and Country song camp, where all of these people from two different communities got together. Pictured at a City of Hope 2017 event (l-r): Hans Zimmer, Clive Davis, Max Martin, John Titta, Marc Hutner (ASCAP) and Loretta Munoz (ASCAP). In addition, we do workshops such as film scoring, composing workshops, and songwriting workshops in all genres. What I love about my job, is that I get to work with every genre of music, and with people at every level in their careers, helping people get to the next level. And then with writers at the top level, it’s helping them to make new connections and also to honor them, so that the world can see how much songwriters, music creators and composers mean. We want to help elevate their profession in that way. DK: You also host awards shows each year to honor the top songwriters in each genre. Titta: Yes, with our awards shows, we honor songwriters, and not just the artists. The songwriters, that’s their craft, that’s what they do, and we recognize them in front of their peers, the industry and the press and media. I know people’s careers have been moved ahead by being at our awards show, because there’s a big producer there who knows that song, but doesn’t know who the songwriter is. I know I’ve brought people over to meet someone, and then they’ve done things together. So to me, these award shows are big for recognition, and to show the world that it all begins with the songwriter. DK: In your Membership department, you have execs who oversee the different genres of music. Can you talk about the leaders of your Membership team? Titta: Absolutely. Every Membership exec is a top person in the game. Heading our Rhythm & Soul department is Nicole George-Middleton. We have Marc Emert-Hutner who’s the head of our pop division. Our Latin division, is headed by Gabriela Gonzalez. In Nashville, Michael Martin runs our Country music division. Shawn LeMone, runs our Film & TV department. Michael Kerker, heads our Musical Theatre division. He signed Lin-Manuel Miranda (creator of Hamilton) and Benj Pasek & Justin Paul (songwriters of La La Land and The Greatest Showman). Then we have our Symphony & Concert division, which is headed by Cia Toscanini, who’s actually a descendant of (legendary conductor) Arturo Toscanini. I think they are all doing fantastic work with the top music creators. 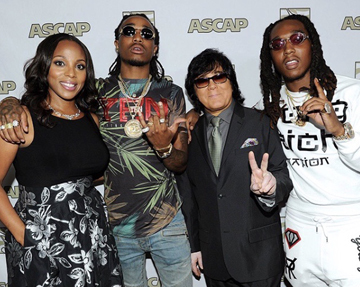 Pictured (l-r): Nicole George (ASCAP), Takeoff of Migos, John Titta and Quavo of Migos. DK: As Head of Membership, you’re always looking to discover and recruit new songwriters, or sign major writers who might be looking to switch PROs. What do you tell them about ASCAP, to convince them that ASCAP is the best choice? Titta: Besides ASCAP’s great history and tradition, ASCAP is the only U.S. PRO that is owned and governed by its songwriter & publisher members. Our Board of Directors consists of songwriters, composers and publishers. Our members can have total confidence that when the Board makes an important decision, they are making the decision with the very best interests of the membership in mind, because they are songwriters & publishers too. ASCAP’s elected President and Chairman of the Board is the amazing songwriter Paul Williams, and he is probably the strongest and most effective advocate for songwriters and composers you could imagine. As a songwriter, not only does he have a legendary catalogue and has won every big industry award — Oscar, Grammy, Golden-Globe, Songwriters Hall of Fame, World Soundtrack — the list goes on — but he keeps creating relevant work and getting more awards for it. We are also delivering incredible results in our members’ royalties and in important innovations to set up their future success. In 2017 alone, we distributed over $1 billion dollars to our members, which is a new all-time high for distributions. We are delivering for people and they’re seeing the results. We also have incredible leadership in our CEO Beth Matthews and with a fantastic senior team who are closing important licensing deals, such as our recent deals with the radio industry, YouTube and more, driving policy changes for our members, like the Music Modernization Act, innovating in digital tools for our members and tech investments for the future. Our members now have access to a whole new suite of digital tools to manage their catalogues that gives them data that can help them make smart business decisions about their catalogues. These factors are in addition to the things we discussed, such as ASCAP EXPO, song camps, workshops and award shows. DK: For younger songwriters who are trying to break into the music business, what good tips can you offer them? Titta: First off and this is very important: I learned this from Tony Bennett. One thing he said that I think applies for songwriters, is “Always remain true to yourself in what you’re doing.” Look at all the people in the world that became great songwriters. Most of the time, they weren’t trying to be something…they were being themselves. When rock & roll was starting to happen, Tony refused to go in that direction. He’s always been true to himself and his music. Tony is now 92 and he’s arguably more popular than he ever was. I think the great thing is to just be yourself. Also, diversify yourself and learn about the business. Another important thing, is no matter who you are or where you are in your career…Keep your overhead low…your cost of living and expenses. To me it’s so important, because even if you never reach that pinnacle, if you find things in the business that you can do and love, and you keep yourself at a certain level, you can get up every day and do something you love every day. You can keep that dream alive. And even if you are at the top of the hill, it’s the same thing. You don’t need to show everybody who you are. You know who you are. DK: Thank you John for doing this interview. Is there anything else that you’d like to add? Titta: Yes. One of the things that’s awesome about ASCAP is that we have a lot of newer songwriters who are hot and happening right now, and we have writers who have been around for a long time who have had a lot of success. The opportunity we have to bring them all together under one tent as one family is a beautiful thing. We get to see how it is a beautiful thing for them too, because they get so excited about meeting and working with their own heroes or working with new people who are really doing interesting things. That what makes ASCAP such a great family.